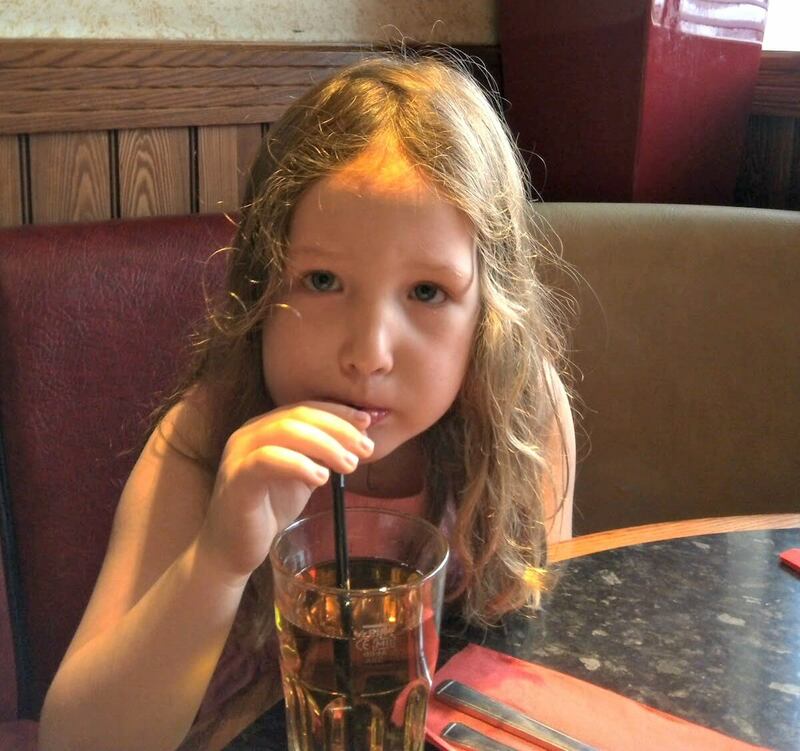 Since we are two days away from returning to school, we decided to take the kids to our nearest Frankie & Benny‘s at Dunleavy Drive, Cardiff Bay. 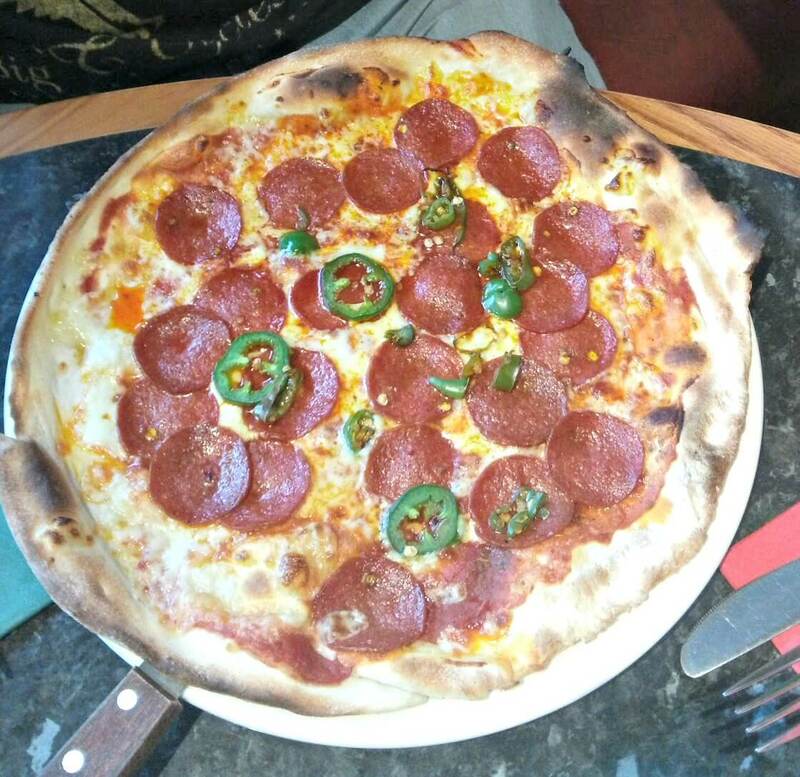 Frankie & Benny’s is an American – Italian style franchise restaurant specialising in pizza and pasta and it has become part of the ‘dining landscape’ in the last few years. The challenge for parents of young children is to find a venue with a low ’embarrassment’ factor; that is to say, if the kids kick off, you won’t attract the gorgon-like stares of those who think children should be seen and not heard (and preferably left at home in the first place). 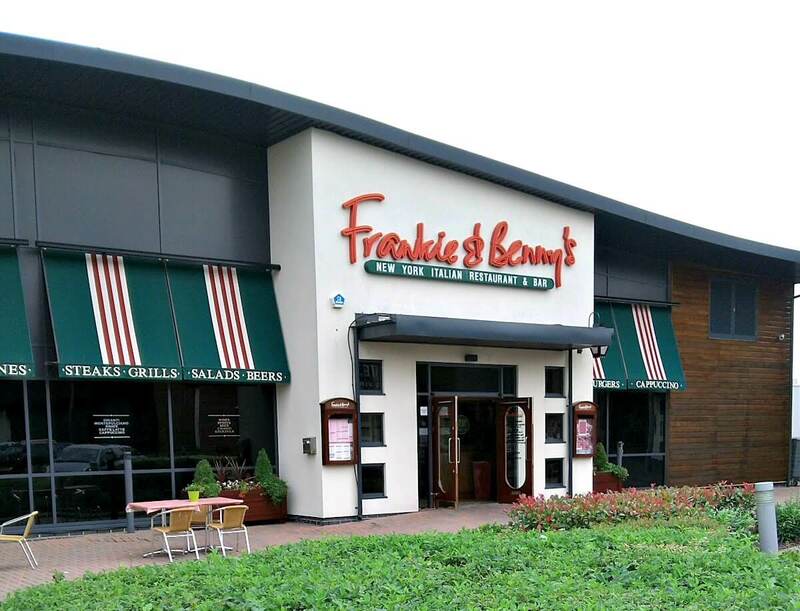 Frankie & Benny’s fits the bill nicely offering friendly staff, free balloons, unlimited apple or orange juice and ice cream sundaes with Cadbury’s Chocolate Buttons. We have become strangely inured in the UK to eating out in the equivalent of airport hangars on soulless retail parks but this Frankie & Benny’s is clean and pleasantly presented with a welcoming Frank Sinatra / 1950’s soundtrack piped outside. A minor quibble is the cigarette butts left along the edges of surrounding shrubbery, but I guess this is a small price to pay for smoke-free restaurants these days. 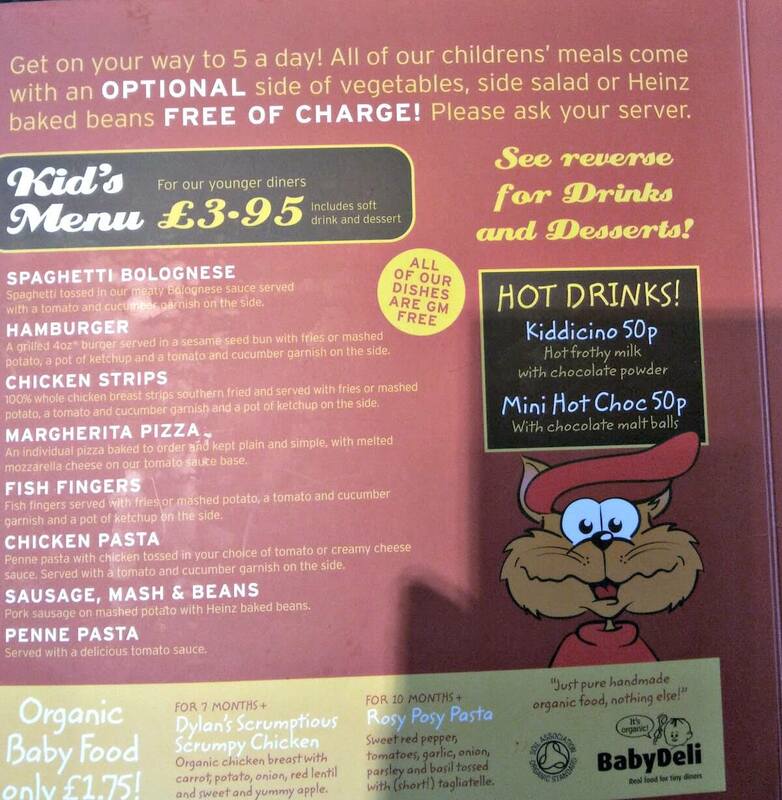 Frankie & Benny’s offer a very reasonable child’s menu and the food is freshly cooked, although this can entail a bit of a wait. On previous occasions, activity packs and crayons have been available to entertain the kids but we lucked out today. 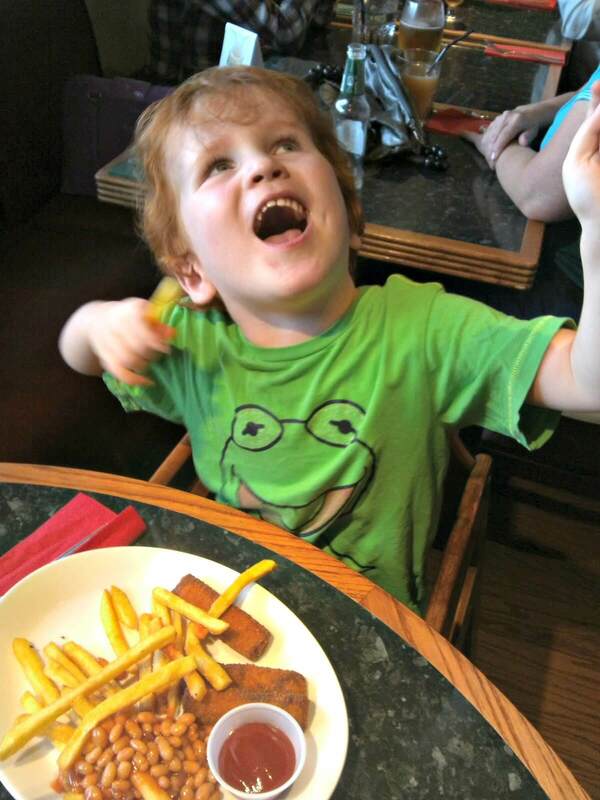 Caitlin chose Chicken Strips (made with chicken breast) and Ieuan chose Fish Fingers, both with chips and baked beans. I had a cheeseburger and hubby elected for the American Hot Pizza. Hubby had a beer and I had a glass of house red. I have learned to be sanguine about the quality of house wine in the UK and this particular house red was just passable. Why there cannot be a wider range of house wines in our restaurants I’m not sure. Profit margins are obviously an issue but I suspect that many food retailers still regard us Brits as uninformed about wine whereas many of us may not be Oz Clarke, but we do recognize a decent wine when we taste one. The food, when it arrived, was standard – in taste, presentation and hotness. My burger was tasty enough although the chips were lukewarm. Hubby really enjoyed the pizza. The portion sizes were generous – in fact, one kid’s meal would have done both our kids. The kids had strawberry sundaes made with a rather synthetic ice-cream but hiding Cadbury’s Chocolate Buttons which went down a treat. Previously the buttons came in separate mini packs which I preferred as you could secrete them away for bribery purposes later! Hubby and I had a coffee – me a latte, him his usual black Americano. The latte was piping hot and you could taste the coffee so full marks on that score. I notice that the new fad for ‘Babycino’ is now on the menu – frothy hot milk and chocolate powder for the kids. Being cynical, this looks to me distinctly like preparing the next generation of caffeine addicts. The total meal came to around £35 for 4 which, these days, is definite value for money. We were also very well looked after by our server, Adam, who was genuinely pleased to see us AND the kids. Another plus for me is that there are ground floor toilets, an excellent sized disabled toilet and that these are clean. The cleanliness of a restaurant’s toilets is always a benchmark for me. I figure if these aren’t kept clean, then the food preparation area may not be either. Sometimes it’s the details that let a business down rather than any glitches in the overall process. Hubby is used to this peccadillo of mine and is used to enquiring “well, what were the toilets like then?”. Frankie & Benny’s passed this test with flying colours. Despite the couple of quibbles I’ve mentioned, we’ll be back. It’s a stress-free, value for money meal out that the whole family can enjoy. Dunleavy Drive, Cardiff may not be Little Italy but at least you don’t need a passport. You’ll find more restaurant reviews here. Looks OK for kids but not keen as two adults with adult kids. Guess we want a different dining experience now our kids are older.